The objective of this study was to investigate the potential of Rhodopseudomonas palustris G5 in promoting growth and inducing salt resistance in cucumber (Cucumis sativus L.). In this study, the growth-promoting potential of the bacteria was studied by measuring the ability to produce indole-3-acetic acid (IAA) and 5-aminolevulinic acid (ALA), fix nitrogen, and solubilize potassium and phosphate. The greenhouse pot experiments were set up to study how strain G5 affected growth and salt resistance of cucumber seedlings. The results showed that strain G5 exhibited plant growth-promoting attributes such as the production of IAA and ALA, as well as nitrogen-fixing, potassium-solubilizing, and phosphorus-solubilizing ability. In pot trials, strain G5 increased shoot height, root length, fresh weight, dry weight, total chlorophyll content, and soluble sugar content of cucumber seedlings under salt stress, compared to the seedlings that were exposed to salt stress in the absence of the strain G5. Furthermore, antioxidant enzyme activity analysis showed that strain G5 strongly increased the activity of superoxide dismutase, peroxidase, and polyphenol oxidase in cucumber seedlings under salt stress. In addition, strain G5 treatment decreased H2O2 and malondialdehyde contents of salt-stressed seedling. 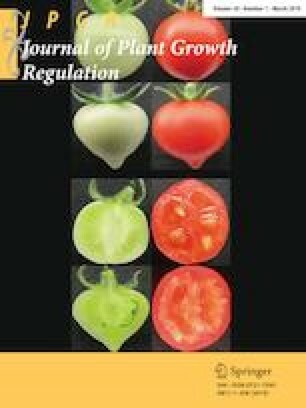 In sum, these results showed that strain G5 enhanced growth and induced systemic resistance in cucumber seedlings under salt stress by the production of IAA, ALA, and soluble sugars, the induction of antioxidant enzymes as well as nutrient adjustment of nitrogen, phosphorus, and potassium. This study was supported by the Science and Technology Planning Project founded by Science and Technology Commission in Henan Province, China (Nos. 182102110290, 182102110074) and by the School-based Program of Zhoukou Normal University (No. ZKNUB215210). HG designed this study and conducted the experiment, as well as wrote the manuscript. FZ analyzed the data. All authors read the final manuscript and approved the submission. The authors have no conflicts of interest to declare. All authors have read and approved the submitted manuscript.